Review copy provided by the publisher, thank you!! A sudden death, a never-mailed postcard, and a long buried secret set the stage for a luminous and heartbreakingly real novel about lost souls finding one another.. The Darby-Jones boardinghouse in Ruby Falls, New York, is home to Mona Jones and her daughter, Oneida, two loners and self-declared outcasts who have formed a perfectly insular family unit: the two of them and the four eclectic boarders living in their house. But their small, quiet life is upended when Arthur Rook shows up in the middle of a nervous breakdown, devastated by the death of his wife, carrying a pink shoe box containing all his wife's mementos and keepsakes, and holding a postcard from sixteen years ago, addressed to Mona but never sent. Slowly the contents of the box begin to fit together to tell a story—one of a powerful friendship, a lost love, and a secret that, if revealed, could change everything that Mona, Oneida, and Arthur know to be true. Or maybe the stories the box tells and the truths it brings to life will teach everyone about love—how deeply it runs, how strong it makes us, and how even when all seems lost, how tightly it brings us together. With emotional accuracy and great energy, This Must Be the Place introduces memorable, charming characters that refuse to be forgotten. Every now and then I enjoy reading a little something different than my normal strictly historical books. That occurs when I come across a novel that piques my interest enough to not feel like it is just another novel to add to the library. Here we have This Must Be The Place, which a Goodreads Site commenter writes that the title was ripped from a Talking Heads song. I have no idea about Talking Heads songs, I have heard of the group, but the fact that the titles are the same does not bother me. In fact, the novel has a lot of musical references to them, as I was escorted to the world of Mona and her teen daughter, Oneida, (yes, like the spoon). One of my own goodreads status updates at page 183: "Flipping fabulous page turner". The third person narration was magnificently done here, as we were able to get inside the heads of many of the supporting characters of the story, such as Mona's long ago best friend, Amy, who was a selfish teenager who looked out only for number one. And although Amy is a figment of the past, she reverberates throughout the story as the poor decisions that Amy made as a teenager puts Amy's husband in an unknown world of grief and soul searching. Amy and Mona had lost touch sixteen years earlier, in fact, Amy had written a never-mailed postcard to Mona at that point, and that post card is what sends Amy's adorable husband Arthur to Mona's boarding house door. He becomes a tenant there, and he tries to unravel the mystery behind that never mailed postcard and find a little piece of his wife with Mona. It is extremely hard to write this review without giving away zillions of spoilers and plot twists. Let me say I loved the novel. I enjoyed the relationships between the boarders and Mona and the interactions that the novel illustrated throughout. The fact that there was only one person in the novel that you had to grow to hate (Amy and a stupid kid Andrew) helped to endear me to the characters' individual stories and their plights. And there was a lot going on here as those in the present were trying to decipher the past and see how that effected their future. There were parts where I knew what was going to happen, the main idea of the suspense part, but getting to that ultimate portrayal of the big secret was a fascinating journey between the many characters from Arthur, Mona, Oneida and the supporting characters. Oneida was the ultimate teen who still loved her mom and has to come face to face with the fact that indeed Mom is also a person, and someone who may have made mistakes in the past. How she comes to grips with the relationship with her mother is the underlying current as we watch as Oneida makes friends as school and falls in love (the rock music enters here). And Arthur unexpectedly shows up into both of their lives at the behest of the postcard, which leads Mona and Oneida into a tailspin of emotions and regrets and unknown truths. Amy writes the postcard with cryptic messages like "You knew me better than anyone—I think you knew me better than me" and "I left you the best part of me." (Which sounds simple enough but the conclusion to this actually surprised me at the end). The story was so real and tangible as it tugged at my heart, and yet the hidden truths gave the novel a cloudy, unknown kind of feeling. Each page sucked me in on the vortex of turbulent misconceptions and incredulous moments between the characters, with its shocking reality that is almost funny; in a vulgar sort of way. Fabulously woven plot lines are present and make this story a myriad of feelings and emotions. Beginning with the threads of grief and the span of time and the knowledge that the healing process needs more than just the time that it takes to not feel numb anymore, the author displays the realization there is always a life to be lived but with the dangerous consequences of either having been loved or grossly ignored. I was impressed at how the author shifted from the adult narratives to the teenager angst that is not shallow but threateningly close to adulthood. These are characters who are real and dimensional and become a part of you; becoming immersed in their story that begins with a single person who is suddenly dead and left behind a box of mysterious stuff. 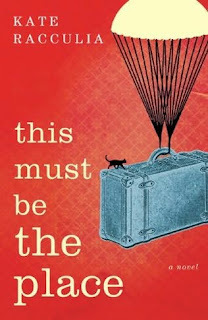 This Must Be The Place is an intriguingly haunting novel that is truly impressive as a debut novel from Kate Racculia, one that I could not put down at all until the very end, and even then I wanted to start it over.